The most visited of the Andaman Islands; the Havelock islands are among the top beach destinations of Asia and one of the prized beach destinations of India. The Andaman and Nicobar Islands being a fairly distant union territory of India is sans its huge population and thus remains a pure tourist spot with only a few so called industries. The Havelock Island is sparsely populated and is an island paradise. It’s beautiful beach shores lined with slivery and white sands with crystal clear waters and plenty of coral to watch, makes it a must visit beach destination for every traveler. In this article we have tried to list out the 5 top places to visit in Havelock Islands to get the best out of your visit. Seemingly the best beach in Asia according to the TIME magazine in 2004, and well, I can totally vouch for that. With its beautiful and sparkling blue waters which make few of the calmest seas I have ever witnessed, Radhanagar beach is the first and the last place you might want to visit when you come to this island. The clear waters further facilitate amazing views of the coral reefs, and snorkeling is a must do activity. 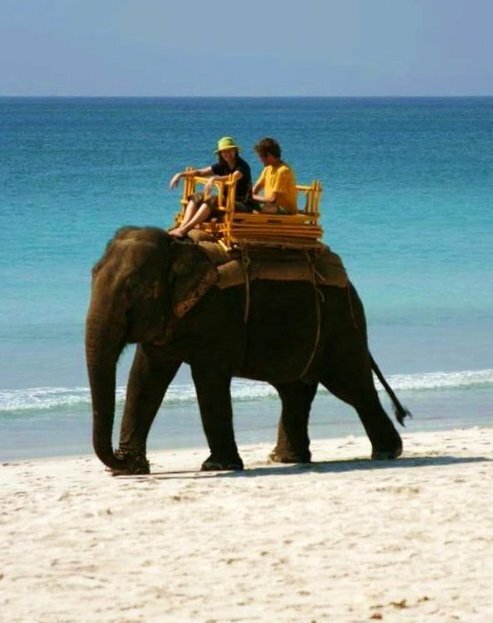 To my surprise, I came across this random guy who gets his elephant to this beach to offer rides. If you need some alone time, try walking to the right side of the beach and find this place called ‘blue lagoon’, or alternatively take your bike through the forest. Radhanagar beach is the place that’ll make you want to stay on this island. I planned an entirely separate trip for this Island alone. This beach has suffered the effects of the 2004 tsunami and has since got reduced in size; you might find a lot of Indians here. Elephant beach is nevertheless an amazing place to visit and is famous for its coral views. The place has a no. of diving and snorkeling centers. I was more interested in coming here and relaxing with my book and some food and drinks. The place is excellent for those who seek solitude and relaxation right in the lap of the Andaman Sea. For the tourists, snorkeling, swimming and scuba diving is the main attraction. The Indian snacks like bhelpuri and panipuri are available here. The people here are pretty friendly and will always smile back at you. Kalapathar beach is quiet a questionable beach for some because of it being pretty far from the main town, but the reason it was chosen for its mention was because of it being an amazing picnic spot to visit either alone or with friends. Cook your own food, and enjoy your afternoon with drinks and music. As the beach’s name suggests, black colored rocks line the coastline here, there’s a forest on one side of the road, and once you cross it, you reach the heavenly and silvery beach where you might get engulfed by the sheer solitude of the calm and relaxing environment. A brilliant place to sit by and start writing some great travel stories. Emerald Gecko is a cottage resort run by a couple named Benny and Linda, who also own another great but expensive resort called the wild orchid. However this place is dirt cheap compared to the other one and is the place to stay when you visit this island. Although I spent a majority of my time here at the beaches only staying at the resort to sleep at nights. The food here was soulful, the menu was small but the food was like what you might get served at home and was really cheap. I being a budget traveler loved how this place was maintained and had amazing comfort and warmth. Not to forget the free filtered water you get here. Full Moon Cafe is the cafe I loved the most, the staff is friendly, the food tasty and cheap and the design aesthetics of this place are simple yet amazingly thought of. Located on beach no. 3, the place has a small library for readers like me. The menu is pretty amazing and extensive with some really good mid ranged food items including local and continental cuisines that taste great. I spent most of my afternoons at this place and made a couple of friends too whom I used to play card with. They play a good mix of classic rock and 70’s and 80’s pop and R&B which made it my instant favorite. A pint of chilled beer, with some great music and food, located by an amazingly picturesque location would make you want to own this place. There’s a lot more that Havelock island has in store for all the travelers and I would totally give it a 5 star travel experience in India. The island is a must visit spot for the people who want to experience white sandy shores with crystal clear beaches and a calm, relaxing environment.